The Dog Training Bible is the complete dog training manual and guides you through every single thing you need to know about raising a happy, respectful dog and a loyal companion through reward training. From learning how to establish yourself as the pack leader, to the six main basic commands like sit, heel, no, stay, down, and off, and all the way up to advanced training techniques to break bad behavior in older dogs, it's all here! This one of the most comprehensive audiobooks for dog training on the market and is a must-listen for anyone thinking of getting a puppy or adopting an older dog. Really good coverage of the topic, people have said about repetitiveness, which to an extent it is, but it helps the info stick. Can see how this method will work, looking forward to trying it! There is no doubt in my mind that the advice and training methods described in this book will work, however I think a good deal patience and tenacity will be required by the individual applying the recommended techniques on a daily basis. I really recommend this book. Easy and understandable. Takes you through a step by step guide to improve training and also helps you understand your dog better. I'm glad I bought it. Very clear and precise. So far so good - our puppy is still only 14 weeks, but doing well with the programme so far. Too many dog books. Too little space. Not any more. 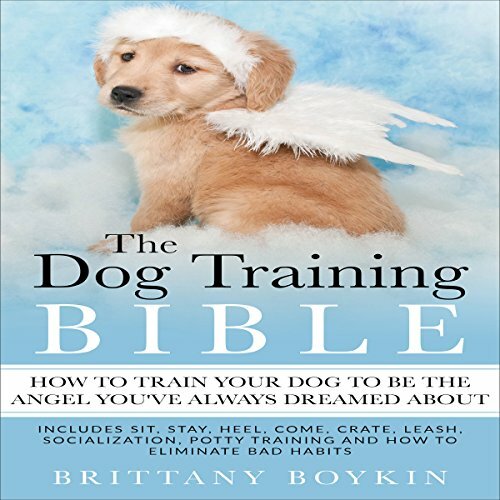 Brittany Boykin's Dog Bible has given us a comprehensive resource for all aspects of dog ownership in just one book. Well organized and user friendly this book serves as a quick reference as well a detailed study on every issue you are likely to encounter as your dog's best friend. Keep it handy. You will be referring to The Dog Bible frequently. If you own a dog, or are thinking of adopting a dog, you need this book. This book will answer many of your questions and even those you haven't thought of. From how to pick a dog to feeding a dog, training a dog and warning signs of illness in a dog...this is the perfect book for dog owners. Still listening to prepare before starting techniques with our dog , but make perfect sense and step by step instructions are great ! Well written, easy to understand and now starts the process of putting it in to practice with a very feisty Italian Spinone with selective hearing!! The book makes sense. great book, just started it but its already giving great advice, i listen the puppy one previously by the same author and was impressed with that. An amazing book filled with very practical knowledge about lots of aspects of dog ownership and training, it's training focused but teaches so much more. Would highly recommend to anyone with, or about to get, a dog. This is a great step by step guide to ensure your dog has trained. I went back to this book a few times to make sure I was doing things right. It was a god send when one day I let go of my dogs lead, by accident, and I used one of the tips from the book to get him to come back to me. Brilliant book , thoroughly enjoying listening it , helpful , witty & superb for dog training , a really good read , I'd highly recommend it . When listening to The Dog Bible as an audio book, purchasing a written copy of the book for reference was a must for me. Whether training, feeding, grooming, or caring for your puppy's medical needs the author of The Dog Training Bible:Everything Your Dog Wants You To Know has researched and presented the subject very well. I consider it an excellent investment. I chose this rating as I absolutely love this... It has all the information I could ever... I would defiantly recommend this book to anyone who has a passion and love for dogs! This book is amazing. It has been--as the title suggests--my bible for taking care of my dogs. Not only have I listen the book from front to back several times, but I find myself using it as a reference in day-to-day life. It is factual, practical, and written in a plain, no nonsense way. I recommend this book to everyone who is considering bringing a dog into their life.